You can satiate your sweet tooth and support a cause you love at the same time! 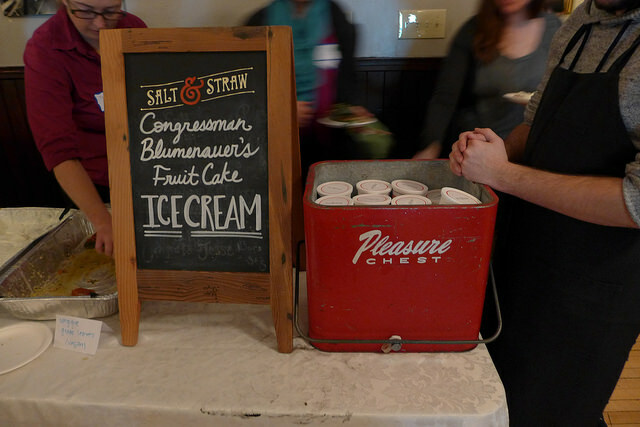 For the entire month of December, proceeds of Congressman Earl Blumenauer’s Fruitcake Ice Cream at Salt & Straw benefit your friendly neighborhood Community Cycling Center. The exchanging of fruitcake is a long-standing tradition, and there’s never been a more infamous fruitcake-gifter in Oregon’s history, than Congressman Blumenauer. For the third year running, U.S. Congressman Earl Blumenauer and Salt & Straw Ice Cream will team up to create Congressman Blumenauer’s Fruitcake, an ice cream version of his legendary homemade holiday fruitcake. It’s never too cold or rainy for ice cream! Hope to see you there.